Fender FC-100 Review: The FC-100 is the best one for the beginning classical player, and it is little thin which makes the younger players happy and alos there is no need of stretching our fingers. And also it includes the accessories which help out the learners to begin. The Fender classical series has only one classical guitar pack, ie., FC-100 which is a non-cut away guitar with fully made of acoustic. And the laminated mahogany and spruce are useful for the construction of the Fender FC-100. The mahogany contains both back and as well as the sides and the spruce is used for the top. Also, the laminate construction is available for low budget with good quality. Go through the entire article for Fender FC-100 Review, performance, design and as well as the drawbacks, etc. The bridge section in this model is equipped with a solid rosewood with a synthetic bone saddle. And there is no any other saddle pickups, preamps and as well as the mics installed in the FC-100 guitar. The neck of the FC-100 is made of mahogany, which has the 12th standard dovetail joint. And aslo the standard contour is available at the back and the nineteenth fret rosewood fingerboard is at the kept at the top. Now have a look at the design part the Fender FC-100. 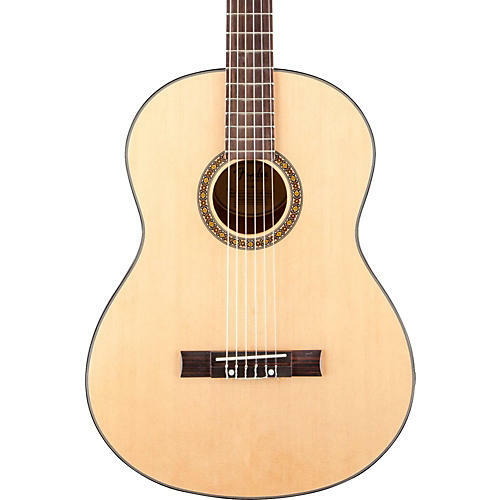 It is a nylon string guitar which has the laminate spruce top with a good looking fan bracing. And coming to the scale length, it is 644mm which is slightly smaller than the big size guitar. The body is made of the gloss polyurethane finish and is bound with good material, bordering is at the top and back. This glossy mahogany neck is made of rosewood, and there are about 19 vintage style frets which are in the D-shaped with a flat radius. And as well the small nut with a width of 44.1mm and the standard classical guitar has a width of two nuts. The sound holes have a wood mosaic rosette. The appearance bag is labeled with the name of the Fender, and this is enough for the transportation of your guitar. And the flashy tuner is a good one which helps you in tuning while you are learning. It also contains the additional pack of strings along inside this bag. And this has a Fender Nylon with a good tie-ends. Coming to the tuning machines these are accessories with a three in one line along with the buttons. This is good or its toughness, and it dynamic capacity. The guitars are not strained because the steel strings are on the tops are not heavier. This is not very expensive, and it is available for the reasonable price range. And this is very rear ro have this guitar bag which includes the guitar and as well as the additional strings. This is not that much attractive, and the sound is toasty and as well as round as the classical guitar. And also it fails in the tone depth and as well as the hard snap for the higher instruments. It has a thin neck with is suitable for the small handed people. This is small in size which is suitable for the people with small hands. And the additional things contains the bag, clip-on tuner and as well as the additional strings. As well as it has the dual action truss rod. The appearance is not good. After a long practice, you feel some what difficulty with the guitar. The cost of the FC-100 is at a reasonable range, and it is designed to improve the standards of the beginners. Finally, it has some additional things in it which are very useful to the guitarists.